Thanks to previous Arab and Byzantine influences that made Sicilians accustomed to a style embellished with marble and gold finishing, the Baroque style flourished in Sicily more or less at the same time as in Spain, reaching its apex in the second half of the 17th century. The importance given to detail contributes to the success of many artists inspired by the exuberance of shapes and the richness of decorations of this style: gratings are minutely worked, balconies are sustained by various figures, often sneering and derisive, the disposition of volumes is studied in depth, and inlay works in multicolored stone compete in diversity and inventiveness. Furthermore, unlike peninsular Italy, in Sicily Baroque included architecture and city planning. At the beginning of the 17th century, the Spanish administration that governed Sicily at the time undertook the construction of some hundred new cities to satisfy the needs of a vast territorial plan. With the earthquake in 1693, which razed the southeastern part of the island to the ground, a major reconstruction was required, which took on a markedly religious connotation. Local authorities, the extravagant and eclectic aristocracy, city planners, and architects all pitched in. The earthquake had opened a huge chasm from Catania to Syracuse. Thus it is in this part of the island that you will find the greatest concentration of Sicilian Baroque, along with the area around Palermo (Bagheria and Trapani), which was the seat of power. 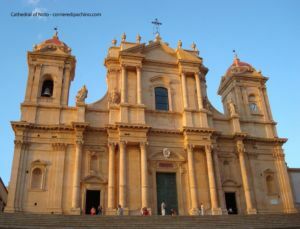 In southeastern Sicily, the Noto Valley was included in the UNESCO World Heritage List in 2002 because of its magnificent late Baroque cities. The eight Baroque cities of this area – Caltagirone, Militello, Catania, Modica, Noto, Palazzolo, Ragusa, and Scicli – already existed in Medieval times, but they were rebuilt, in part or entirely, after 1693 in the predominant style of the time. Known in ancient times by the name Ibla, Ragusa has two distinct city centers, one rebuilt after 1693 and the other reconstructed following the old Medieval model. 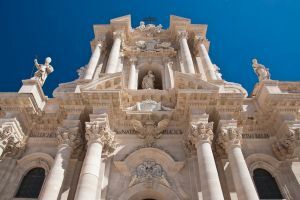 The Baroque style in Ragusa is represented by nine main churches (among which the Chiesa di San Giovanni Battista, the Chiesa di San Giorgio, and the Chiesa Santa Maria dei Miracoli) and seven “palazzi” (among which Palazzo della Cancelleria, Palazzo Bertini, and Palazzo Cosentini). Palazzolo and Modica also have two city centers. In Palazzolo the first is the Medieval center, around which the city was reconstructed after the earthquake. The ‘new town’ later developed around another city center. Particularly noteworthy are the churches of San Sebastiano and of the Santi Pietro e Paolo. Modica is also a town of rare beauty, with the old city center perched on a hill of the Iblei mountains, the new center is instead built in the valley. Among the monuments of the city, particularly noteworthy are the Cattedrale di San Giorgio and the Chiesa di San Pietro. Caltagirone, too, has strong ties between pre- and post-earthquake construction. Its sumptuous architecture and the beauty of its facades is evident in churches such as Santa Maria del Monte or San Giacomo Apostolo, and in “palazzi” such as the Corte Capitanale and the Civic Museum. Militello in Val di Catania has a very peculiar pre-1693 city plan which was copied faithfully in the late-baroque reconstruction (see the churches San Nicolò and Santa Maria della Stella). Noto was instead rebuilt on an entirely new site, also on two levels. The newer part, on a slope, has a series of buildings and streets in Baroque style (see Palazzo Ducezi or the San Nicolò Cathedral). Catania was also rebuilt from scratch, a true late-baroque jewel with its splendid Piazza del Duomo and the beautiful Via dei Crociferi. Finally, the last late-baroque jewel of the Noto Valley is beautiful Scicli, where churches and villas form an astounding urban panorama. In particular, the decoration of the façade of Palazzo Beneventano is of great artistic and architectural import.